The story was told in 2014 in Unbroken, but that movie only hinted in the end at the best part: Jesus’ saving grace. 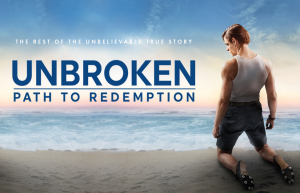 The sequel Unbroken: Path to Redemption picks up where the first movie left off and leads us to the night in 1949 at a Billy Graham Crusade. It is there where Zamperini found the faith and determination to overcome alcoholism, repair his marriage and forgive the very men responsible for his personal torment. Both screenplays were based on Laura Hillenbrand’s bestselling book, UNBROKEN: PATH TO REDEMPTION which spent four years on The New York Times best-seller list; 15 weeks in hardcover and 20 weeks at #1 in paperback. In the 1940s, Post Traumatic Stress Disorder (PTSD) was widely experienced but not widely understood, so Zamperini had little to fall back on. We become a witness to a train wreck—so much to live for being thrown away. A spouse can only handle so much too, so at what point should Cynthia say enough is enough? Telling a person dragged down by suffering to turn to Christ can sound hollow. And so it was with Zamperini. The joy of Christianity can seem make-believe to one who feels forgotten by God. Watching the pain unfold and the path to redemption is a story for everyone given that life can put us on either end of this scenario—one suffering or one trying to help another. It is a real-life testimony to what faith can do and also to the fact that it’s not necessarily easy to get someone to that point. Here are some other interesting notes about the movie. While Zamperini established a meaningful relationship with Jesus Christ, Catholics will likely notice a scene during Zamperini’s homecoming party which includes some words of advice from a Catholic priest. Zamperini was actually raised Catholic. His Catholic parents immigrated from Italy to New York and moved to Torrance, California when he was two-years old. Zamperini had a lifelong friendship with Billy Graham and died in 2014 at age 97.
just died in February of this year at the age of 99. 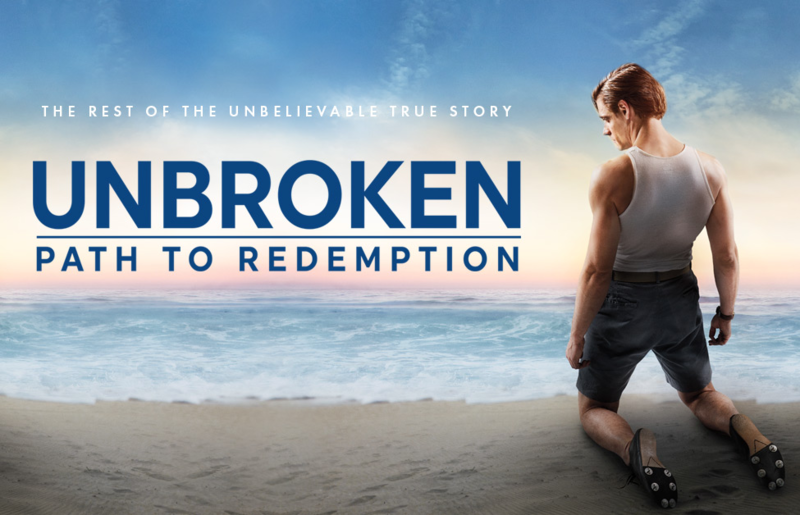 Unbroken: Path to Redemption, rated PG-13, opens in theaters September 14.